A steel pipeline carries water from Lochalsh dam to Nostie Bridge power station. 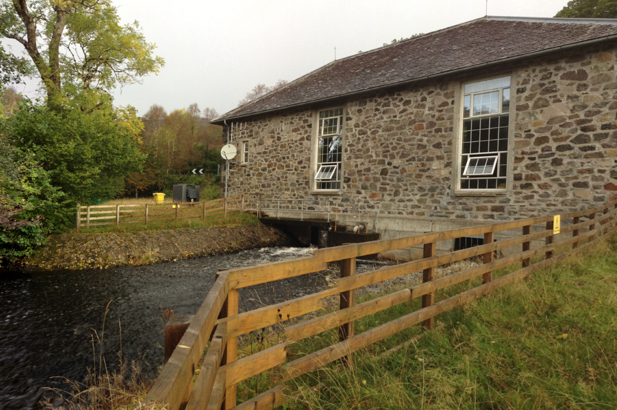 When architect James Shearer designed the station, he chose ‘local stone of a colour that would blend harmoniously with the changing colours of the Highland landscape.’ This thoughtful approach to the look of buildings and dams helped local people to accept the hydro schemes. In the 1940s and 1950s, the government built a number of small hydro systems to serve isolated communities. Nostie Bridge was one of the first completed in 1948. Today, Nostie Bridge feeds into the national network.